Participants: Steve Plock, Ed Corn, Rich Russel, Dave Molter, Gary Agranat. Summary and photos by Gary Agranat. 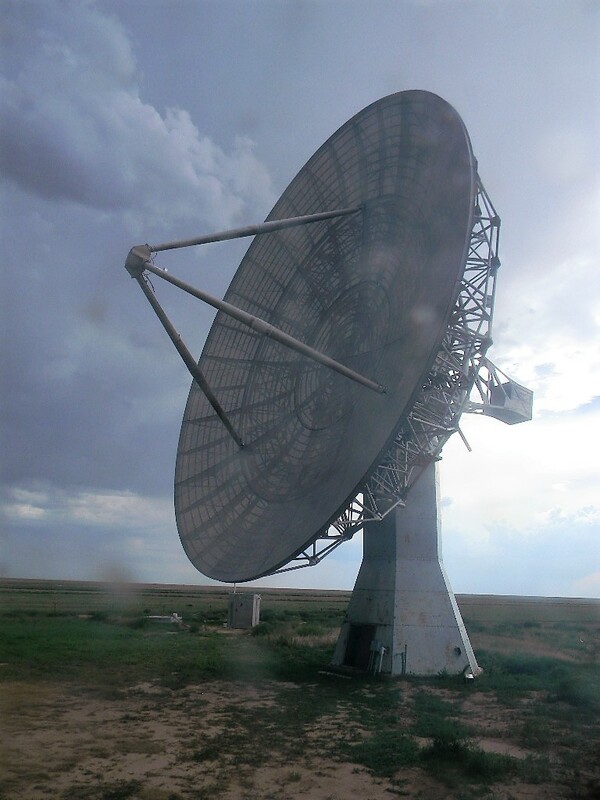 We worked at the Plishner Radio Telescope site on Saturday August 25, 2018. One motivation was to proceed with needed infrastructure work before the cold of winter returns. Another motivation was to follow up on the observations we made during the Open House with the 60-foot antenna. In addition, the antenna tuner for the bunker ham radio station was still not running, and needed to be checked. Here is a summary of what we did, with some photos. 1. Ed and Steve replaced the outflow hose from the ramp sump with one more durable (including durable against mice). Ed tested that the outflow did drain away from the ramp area. We placed a new aluminum manhole cover on the sump access (vs the original steel one), fabricated by Steve. 2. Ed moved the Internet hotspot to the bunker. 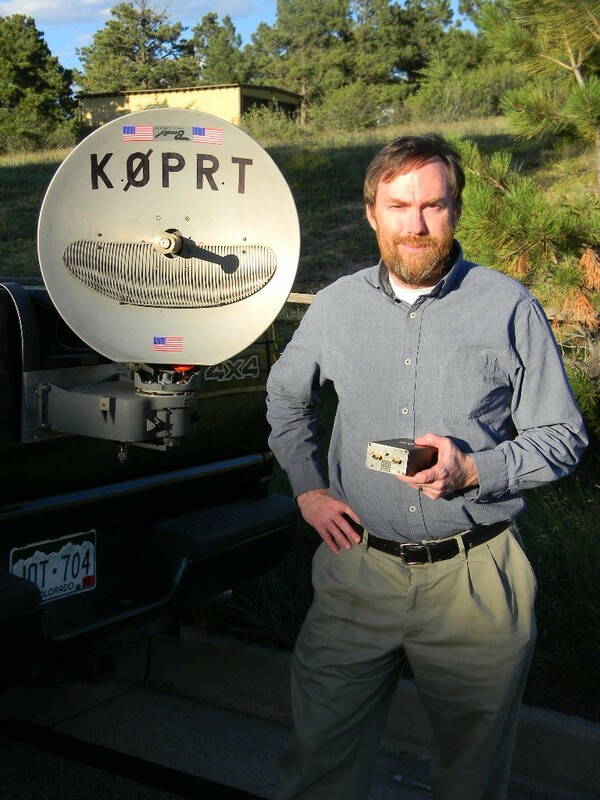 The hotspot was used by Gary while testing and operating the ham radio station. 3. 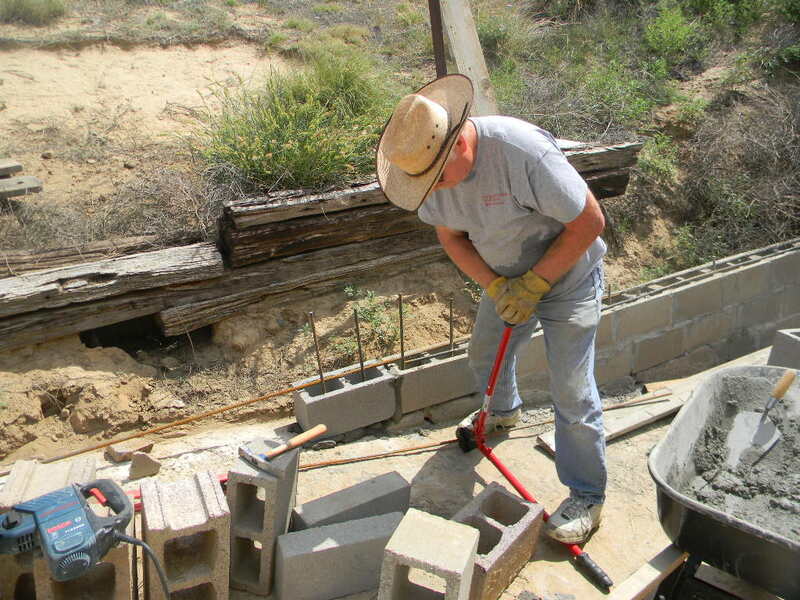 Dave brought 20 x 60-pound bags of cement, and used all of them to continue to repair/rebuild the ramp retaining wall. 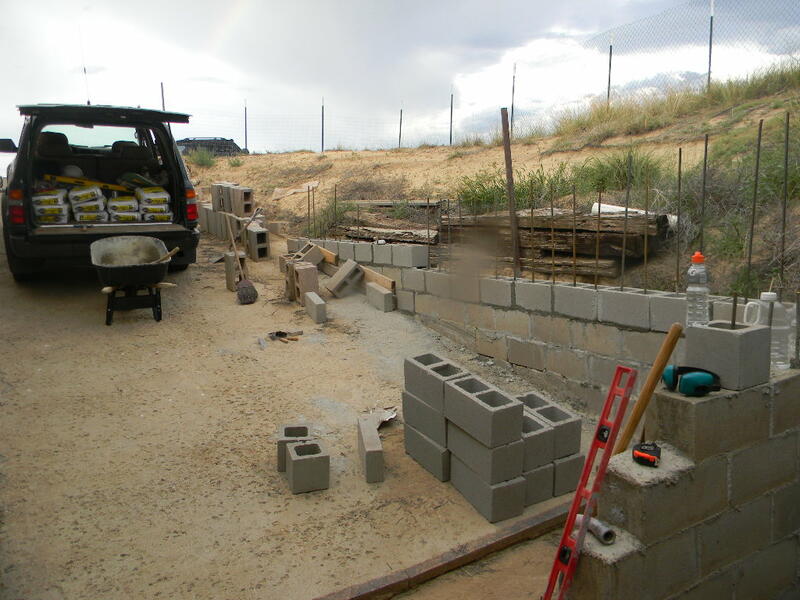 He made considerable progress extending the base of the wall. 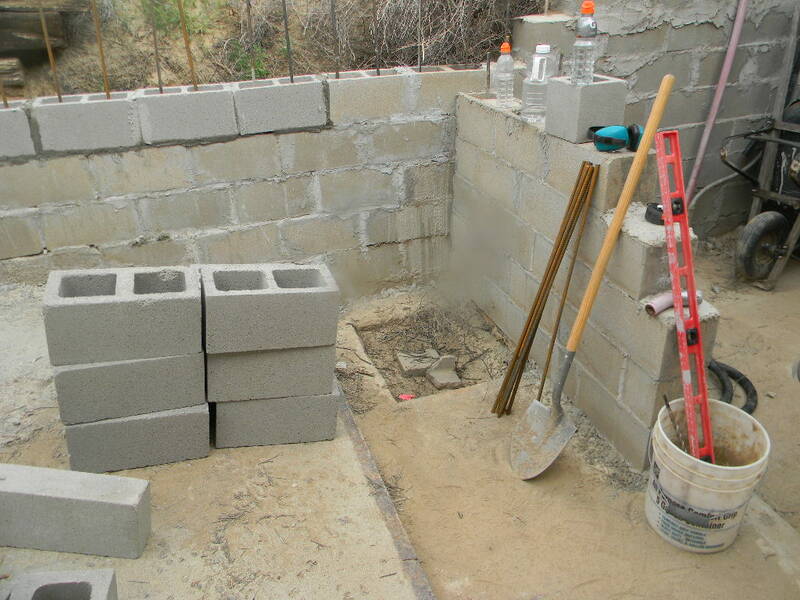 The higher the base of the wall reaches up the ramp, the less rain sediment will clog the sump pump. Dave stayed until late in the evening, until around sunset. Gary stayed with him and gave some help. 4. 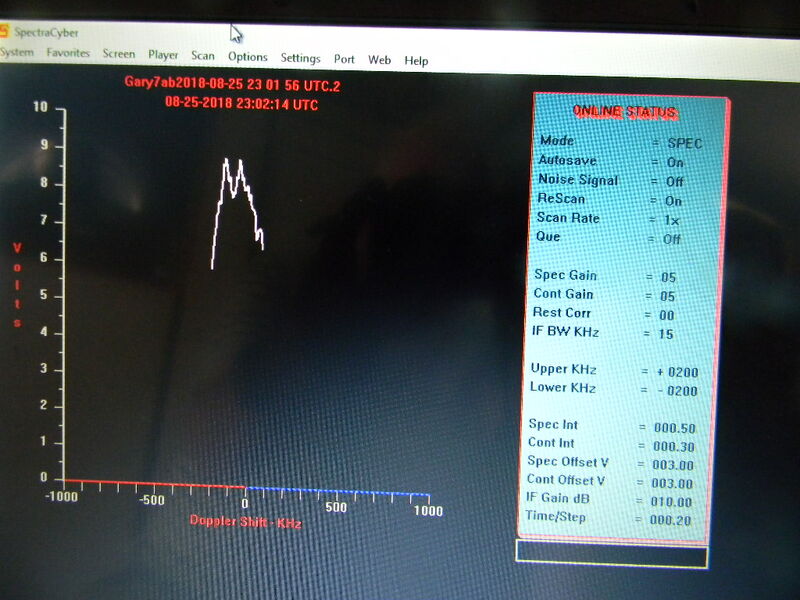 Rich brought the SpectraCyber 1420 MHz Hydrogen Line Spectrometer, and used it to continue to test the functioning and ability of the SpectraCyber together with the System 1 pointing system on the 60-foot antenna. Rich later showed Gary how to steer the dish antenna, and how to measure and record neutral hydrogen data. By the end of the day we located and measured several radio sources in the Sagitarius region. And we made a systematic scan almost perpendicular to the Milky Way galactic plane, in order to measure neutral hydrogen while pointing away from and in the plane. A more detailed discussion follows later in this post. 5. Gary tested the setup of the newly installed auto tuner for the FT-897 in the bunker ham station. 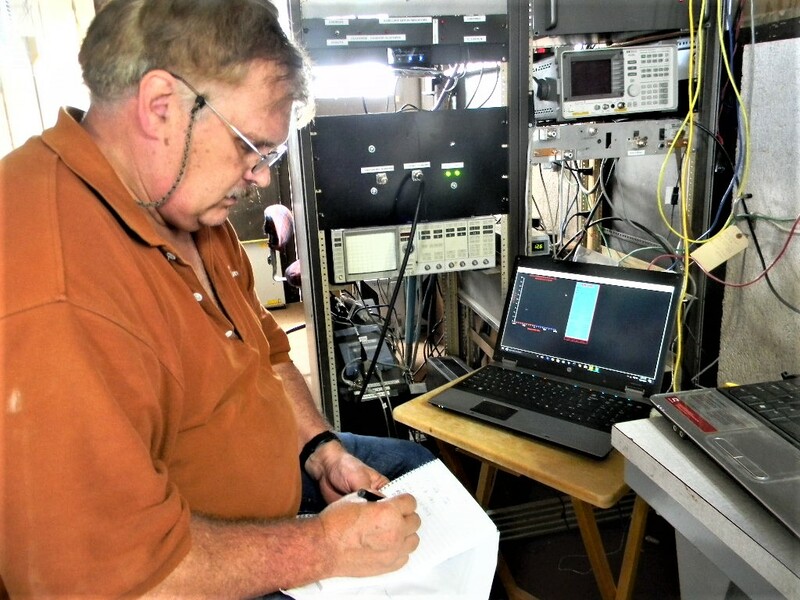 With some adjusting and checking of cable connections, the tuner was found to be functioning OK. Gary took the opportunity to operate K0PRT in the QSO Parties this weekend for Kansas, Ohio, Hawaii, and for the US & Canadian islands, making about 30 contacts, on SSB and CW, on 40, 20, and 15 meters. Signal reports were mostly good, which seemed to indicate the combined FT-897 + tuner system is working OK. Gary wrote some Guidance Notes for using the tuner, and left those next to the tuner. 6. We received 20 QSL cards in the mail from the Open House special event station. Myron passed them on through Ed to Gary. 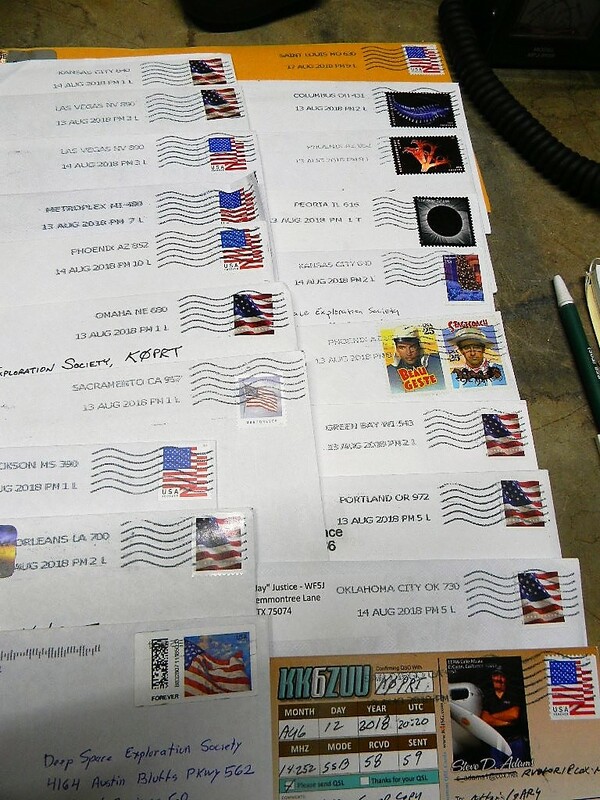 Gary responded to all of them, and sent in the mail our QSL card responses to all by Monday. Next are some photos of our work. 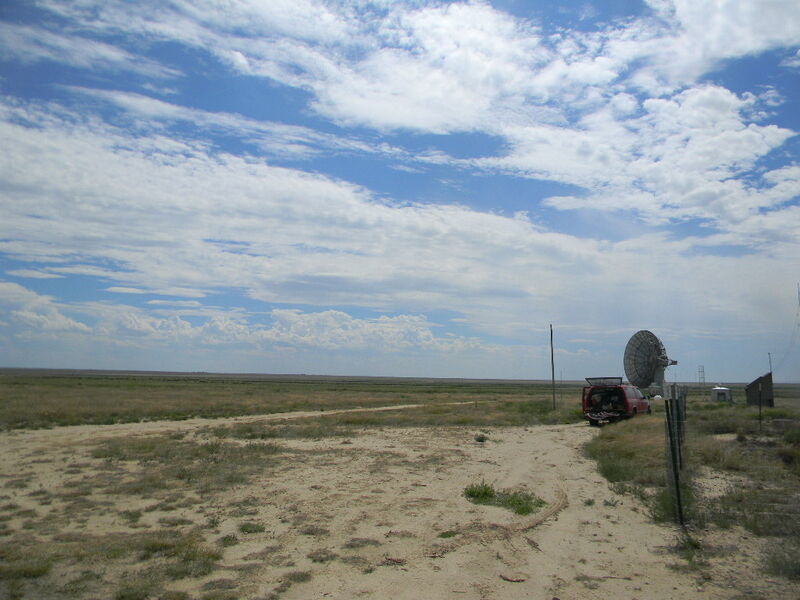 Then follows a more detailed discussion about the SpectraCyber observations with the 60-foot antenna. 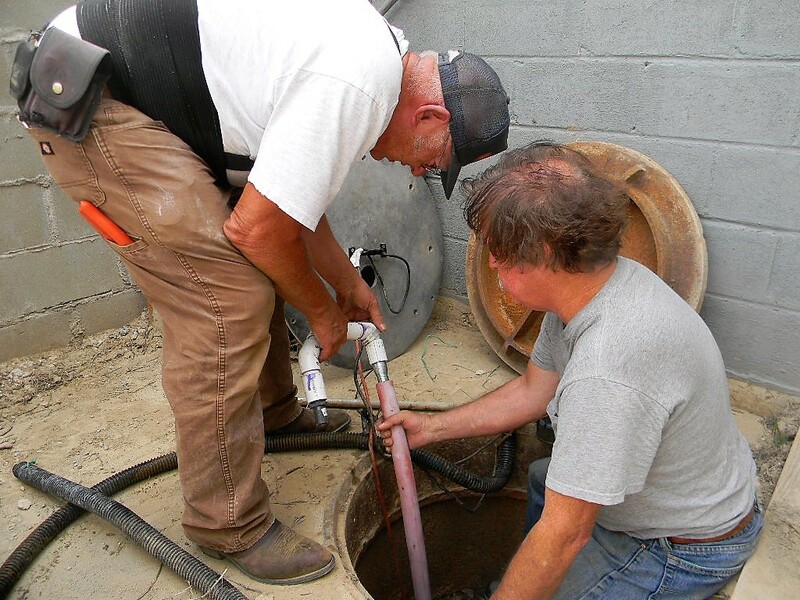 Ed and Steve replaced the outflow hose from the outer sump pump. The new hose has a more robust thick wall to protect it. 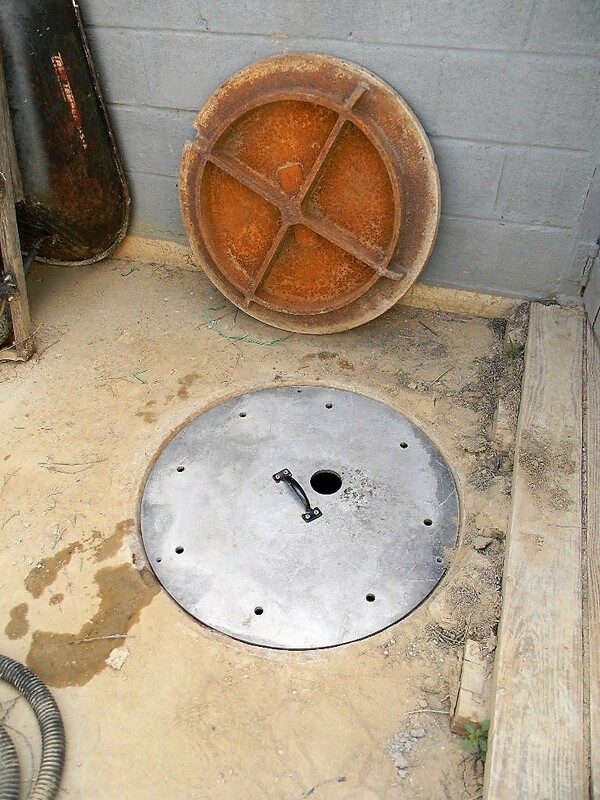 Steve fabricated a new manhole cover for the outer sump. It is made of aluminum, and is much easier to handle than the original steel cover (seen leaning against the wall). The holes allow water runoff to flow into the sump during rains. 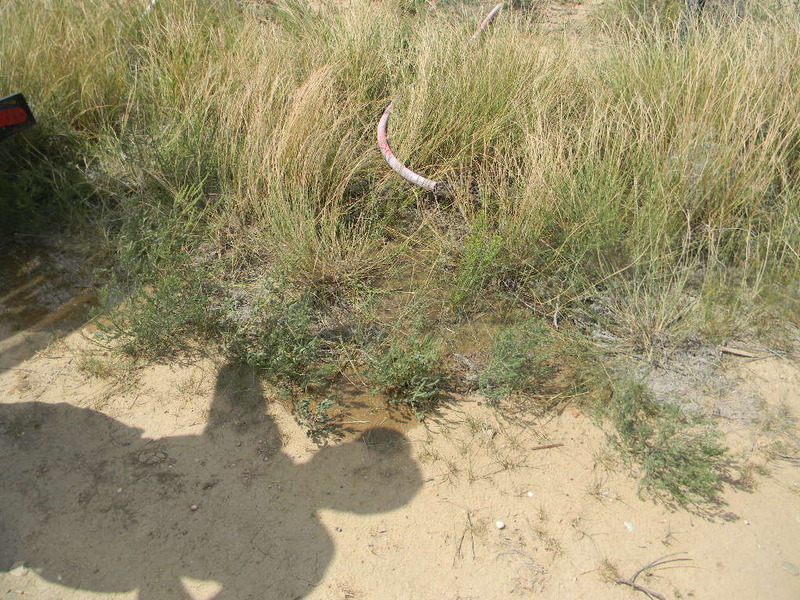 The exit of the sump outflow hose reaches well away from the ramp area. 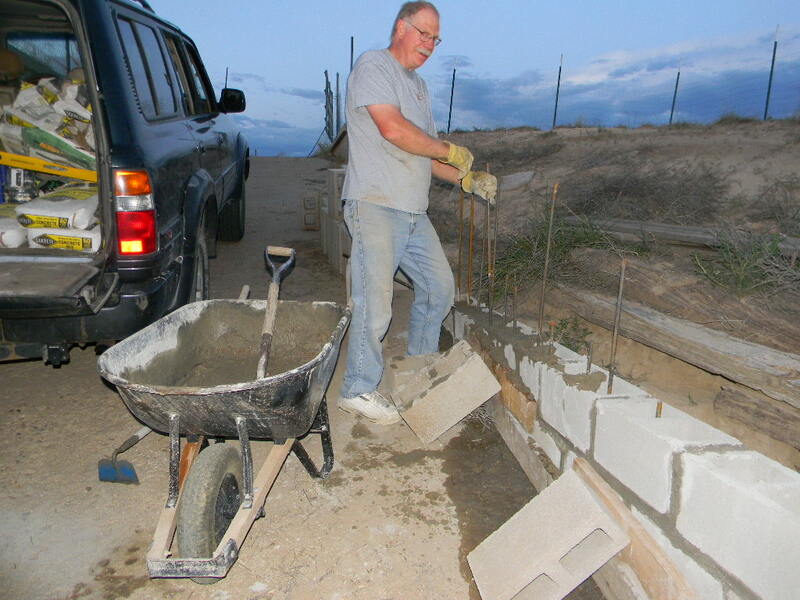 Dave Molter devoted the afternoon and evening to continuing the repair of the ramp wall. Here he is drilling holes for the steel reinforcement bars. Cutting the re-bars to suitable sizes. 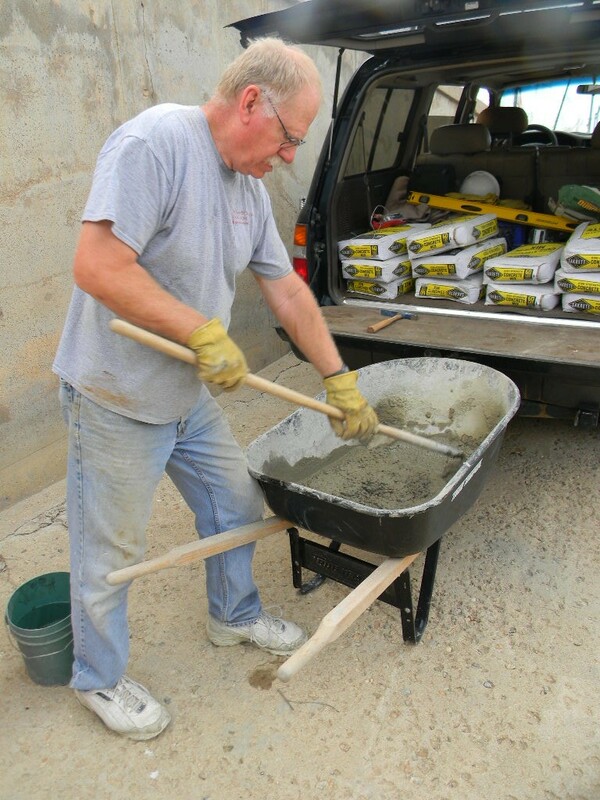 Mixing the cement. 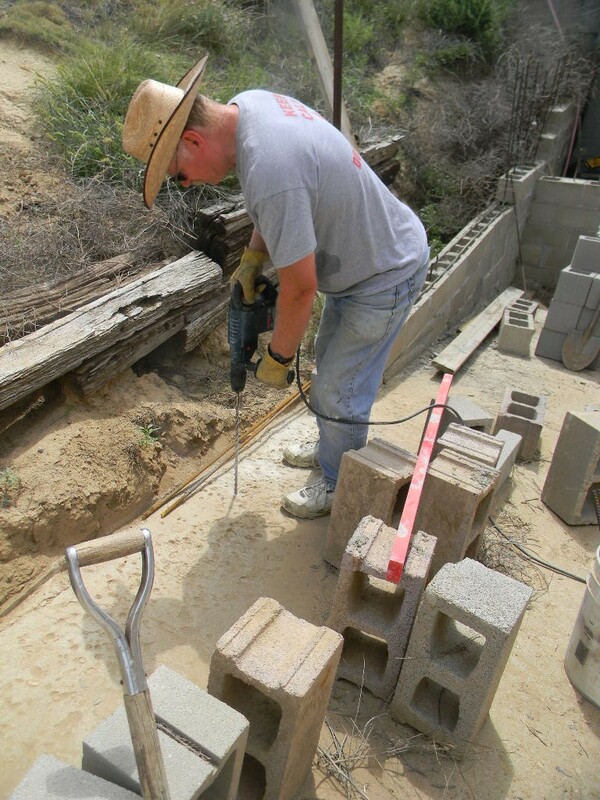 Dave brought 20 x 60-pound bags of cement and cement blocks to continue the wall repair. View of the wall repair work, late into the afternoon. View of the wall repair work, late into the afternoon. You can see by how much more the wall has been extended. 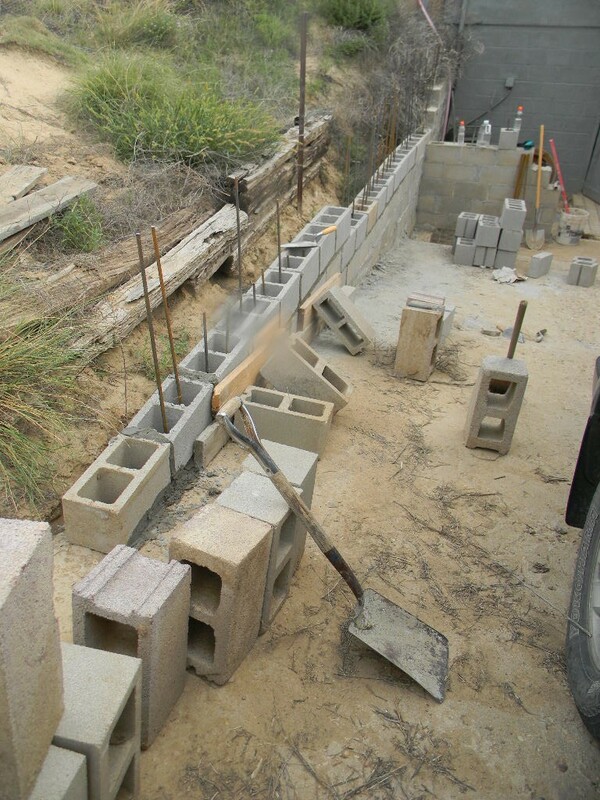 One purpose of the wall is to control the erosion of the soil on the side, and prevent rain runoff with sediment clogging the sump pump at the base of the ramp. Some rain showers passed just to the south late in the afternoon, as was in the NWS forecast. Dave stirred the cement inside the blocks, to eliminate the air pockets. 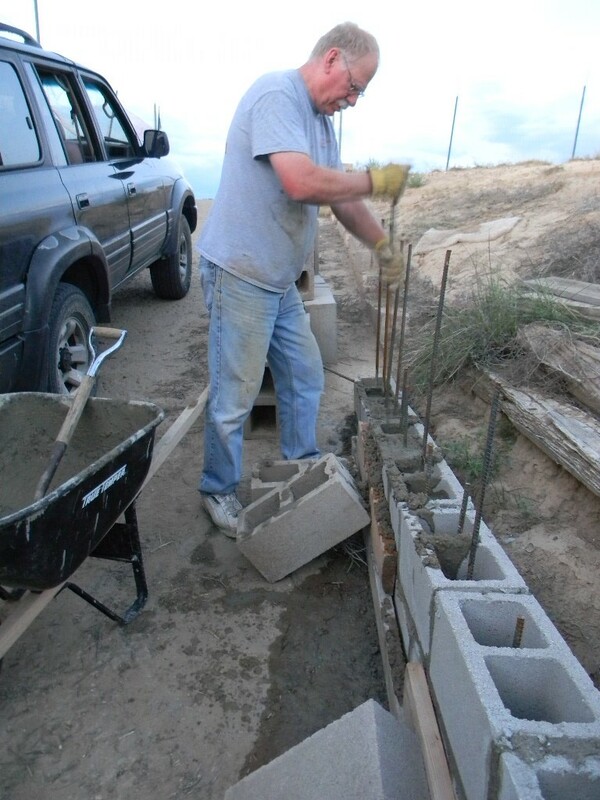 Dave worked on the wall until sunset, and used all of the 60-pound cement bags he had brought. It was a lot of physical work. Rich brought the SpectraCyber 1420 MHz Hydrogen Line Spectrometer, to follow up on the successful observations we started to make with the 60-foot antenna during our Open House 2 weeks before. We used the System 1 pointing system. I later joined him by mid afternoon, after I finished my other work, and this is a report of what we did. We started by searching for several sources with flux density values higher than 200 Janskies. However, at first no sources were found. The plane of the Milky Way was at that time very low along the southern horizon. There were few strong sources on our list available to look for at that time. Sagitarius A, the center of our Milky Way galaxy. The radio emission is thought to be from the secondary effects of a black hole there. CTB 37, a supernova remnant about 20,000 light years away (see https://www.nasa.gov/mission_pages/chandra/ctb-37a.html.) 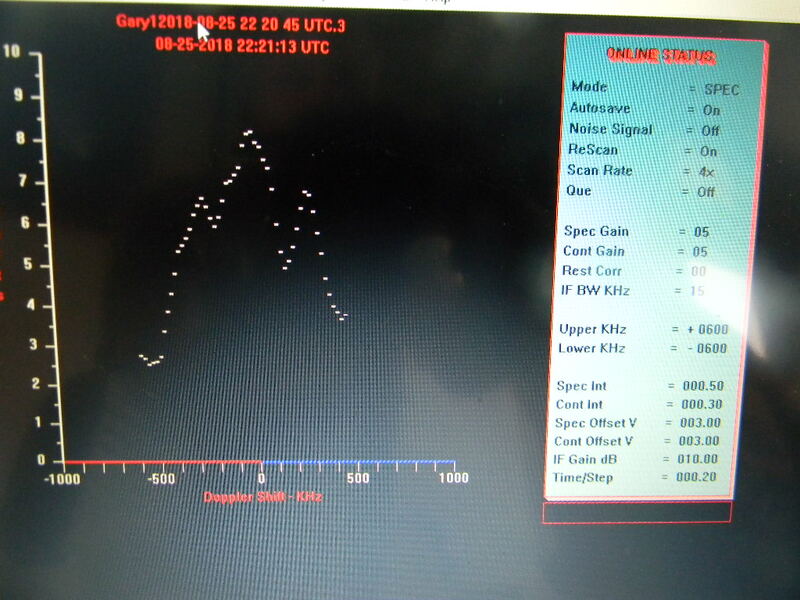 Our signal trace showed three peaks through most of our scans. Our interpretation is that the central peak is the original supernova remnant. The other peaks would be the doppler-shifted material outflowing away and towards us, following the supernova explosion. The Sagitarius Star Cloud Messier 24, with a colder hydrogen cloud closer along the line of sight that absorbs some of the M24 hydrogen signal. This is the radio source Tony Bigbee pointed to during our Open House 2 weeks earlier. 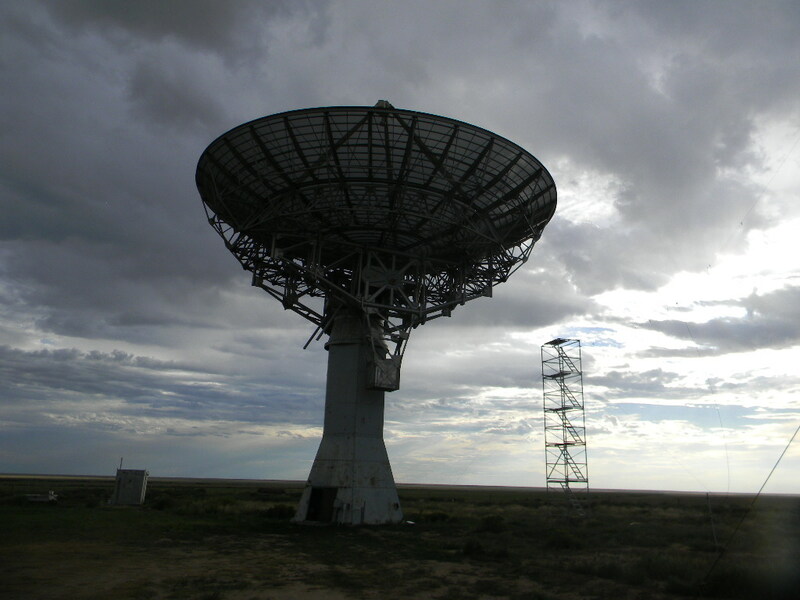 The signal trace has a distinctive dip, which had been identified in data from the Parkes Observatory in Australia. And as Tony has discussed, was used in the past by the RASDR2 team as an engineering detection test. The dip in signal is interpreted as a hydrogen cloud along the line of sight that is colder than the background source. It absorbs the background signal and then reradiates it out, but in all directions, hence the net signal to us is reduced. We used the RA & Dec location coordinates recorded during the Open House. We found the source again without difficulty. We used the System 1 computer display to read the angles our 60-foot antenna was pointed to. The display showed coordinates in both azimuth & elevation (Earth ground reference), and Right Ascension & Declination (celestial sky coordinate reference). We turned the antenna with the manual steering controls. At this time we do not have automatic tracking ability. But we were able to reasonably stay on our targets with continual manual adjustments. What we more often did was we found our source, then allowed the antenna to scan at the set elevation as the Earth rotated, and as a result get a short scan along a line of Declination. We then moved the elevation up and down slightly, to see differences in the scans a little north and south. We used this technique also to hone in on targets. We then manually scanned across the Milky Way galactic plane, to obtain a slice from 16 to 20 hours Right Ascension, along the declination of -05 degrees. We stopped at intervals of 30 minutes Right Ascension (e.g., 17h 00 min, 17h 30 min, 18h 00 min, …), to let the SpectraCyber take full scans. Our scan cut a steep acute angle through the width of the galactic plane, going across the constellations of Ophiuchus, the north edge of Scutum, and the southern part of Aquila. We therefore started and ended at angles pointed “above” and “below” from the galactic plane, and scanned across the galactic plane in between. Since we were pointing to the southeast (and not due south), if we moved azimuth while maintaining elevation, the declination still changed. And so to keep on the -05 degree declination line, we had to adjust azimuth and elevation together. The SpectraCyber display showing the signal we saw at the location of Sagitarius A. The scan traces frequency from 500 KHz below to 500 KHz above the 1420 MHz neutral hydrogen frequency. The vertical axis measures the strength of the received signal, in volts. Sag-A is believed to be a super-massive back hole at the center of our galaxy. The radio source is thought to be created by the secondary effects of infalling matter at the surrounding accretion disk, and perhaps also from material ejected at the rotational poles. Our scan at the location of CTB 37, a supernova remnant about 20,000 Light Years away in our galaxy. We think the original star that exploded as a supernova is the central peak. The two other peaks at offset doppler shifts would be the shells of gas flying towards and away from us, from the explosion. The Sagitarius Star Cloud, also known as Messier 24, with a colder dark gas cloud closer along the line of sight, absorbing some of the hydrogen signal from M24. This is the object Tony Bigbee observed during our Open House. We were able to locate it again without much difficulty, using the coordinates we recorded then. A composite image showing a chart of the part of the Milky Way we scanned across. Shown with it are example signal traces away from and in the galactic plane. The shaded blue areas on the chart are where the Milky Way is in visible light. I wrote in red the path of our scan. Also written in are the locations of Sag-A, CTB 37, and M 24. (Click for a full sized image.) Notice that our scan cut across an apparent gap in the visual Milky Way, around 18 Hours RA. 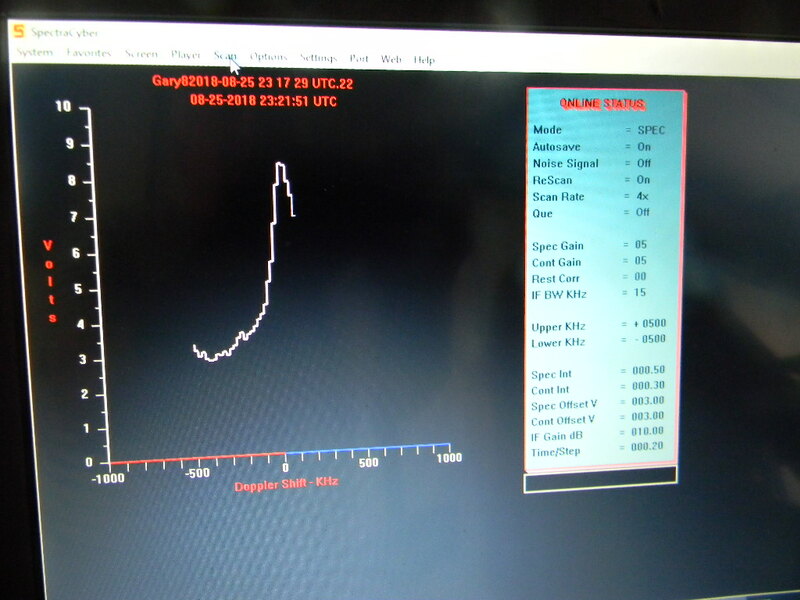 But we saw an increase in neutral hydrogen already by 17 H 30 minutes (to the right, earlier in our scan). That indicates the apparent gap is just caused by intervening dust blocking the visible light of the stars. The radio measurement of neutral hydrogen over that area shows the galactic plane is in fact there. A view of the 60-foot antenna while we were scanning across the Milky Way. A rain shower was passing just to the south. Rich Russel recording notes during our observations. 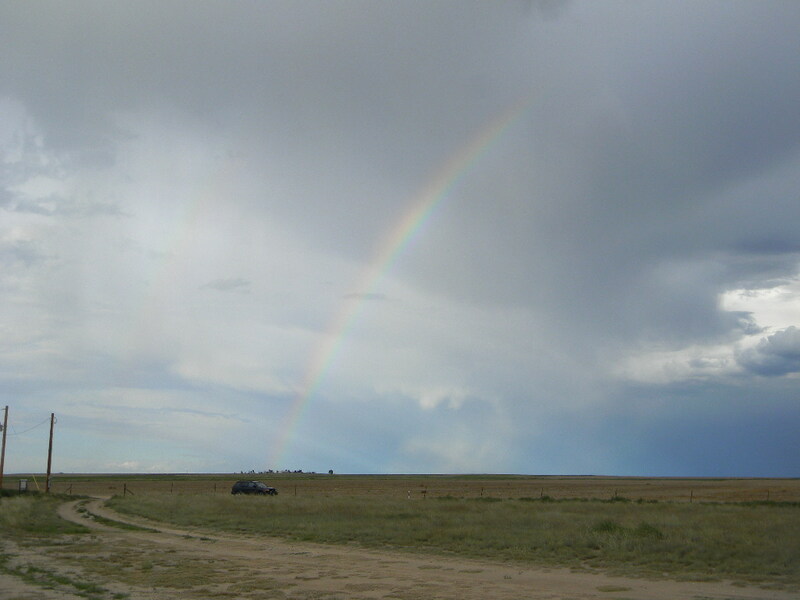 We saw a rainbow as Rich left. 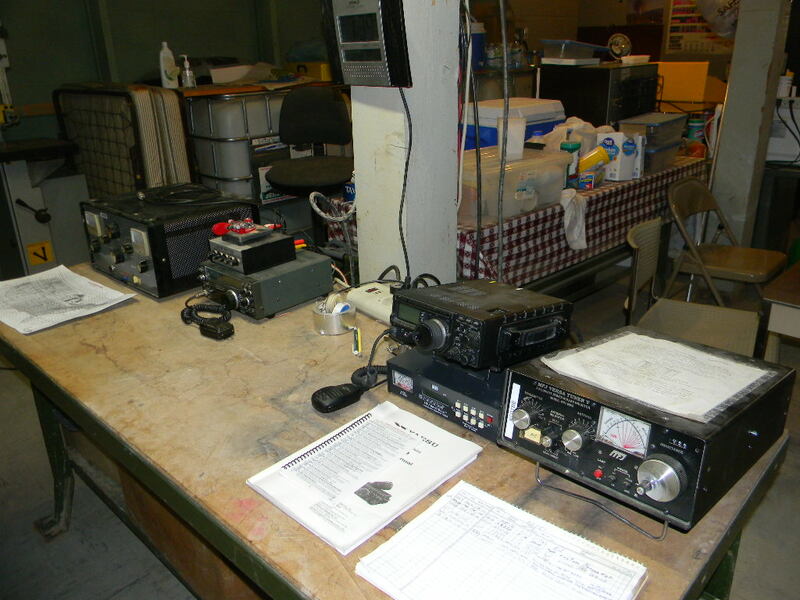 Our current ham radio station set-up in the bunker. The auto tuner is below the Yaesu transceiver and is functioning normally. For this location we have dipoles for 160 and 80 meters, and a multi-band trap vertical antenna for 10, 15, 20, 40, and a portion of 80 meters. The antennas are tuned well enough that we don’t require tuners for most of the spectrum on those bands. 60-foot antenna, in stowed position. On the following Monday we had our monthly DSES Science Meeting at the home of Rich Russel. At the meeting we discussed the observations we made with the 60-foot antenna two days earlier. Tony Bigbee then also presented deeper details about his RASDR4 (Radio Astronomy Software Defined Radio). And he gave us more background about the earlier RASDR2 observations of Messier 24, with the dip in frequency. And he showed how he researched the earlier Parkes observatory data to find useable results and plots for us to compare to. Tony Bigbee with his RASDR4 (Radio Astronomy Software Defined Radio), at the DSES Science Meeting August 27, with Steve Plock’s 10 GHz mobile antenna.